Yemeni security forces use water cannons to disperse anti-government protesters in Taiz on May 9, 2011. Sanaa, Yemen (CNN) -- Yemeni security forces opened fire on protesters in Taiz on Monday, killing at least six and injuring hundreds, a medical official in the southwestern city said. Security forces moved in to disperse the marchers with batons and tear gas before opening fire with live ammunition, witnesses said. The marchers were teachers -- accompanied by opponents of the government of President Ali Abdullah Saleh -- who were protesting salary cuts. 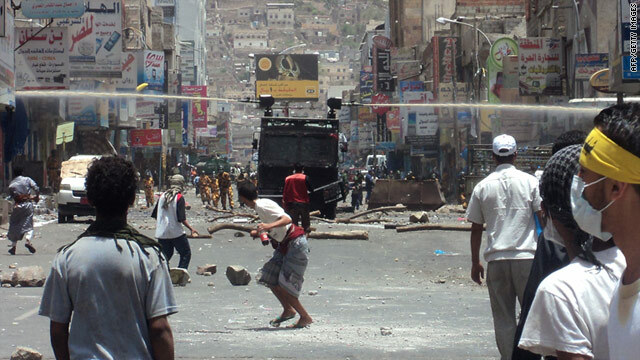 Clashes occurred in five locations in Taiz, the witnesses added. Similar clashes occurred in al-Hodiedah, a city on the Red Sea, and in Dhammar, witnesses and medical officials in those cities said. Government officials declined to comment on the reports. CNN cannot independently verify the witness accounts. Saleh's impoverished and unstable nation has been wracked by anti-government protests and clashes between demonstrators and security forces for many weeks. Monday in Taiz, more than 50 of the injured had gunshot wounds, while others were suffering from the effects of tear gas or other injuries, said Salem Sharjabi, the media liaison for the field hospital there. Several of the injured were in critical condition, Sharjabi said. Three of those protesters who were fatally shot were teachers, said Fuad Dahabi, the president of the teachers' syndicate. "The government is using force to make us give in and go home. This is our home and we will protest until the last man," said Muneef Ariki, a youth leader in Taiz who was involved in Monday's protests. "Nearly 100 days have passed and we are being killed and oppressed by this regime," said Abdul Salam Mikhlafi, a protester. "We vowed to hold Saleh accountable and no immunity will save him from the wrath of his own people." The Organizing Committee for the Youth Revolution, which helped organize the protests, said that security forces arrested at least 15 activists at the protests. "Most of those arrested were female activists," a committee member said. Protesters also were attacked in al-Hodiedah's change square by Republican Guard forces on Monday, resulting in seven protesters being shot, witnesses and medical personnel said. "Attacks on protesters is a sign that our mission will soon be accomplished. Attacks is the last option in front of a dying regime," said Rami Suliaman a protester in al-Hodiedah. Security forces also attacked anti-Saleh protesters in Dhammar city, witnesses and medical personnel there said. Medical staff confirmed that 12 were injured, six of them with gunshot wounds.